Over the past 5 days , the Nashville Predators have traded away Shane Doan, Pavol Demitra, and Dan Boyle. Doan and Boyle have been with the team since the inaugural dispersal draft and the moves represent a new chapter in the Predators short but exciting history. With new financial realities setting in here in the NEFHL, Predators GM Mathieu Morin came to a realization that the current team structure would leave the team decimated at the end of the season. Rather than wait for this uncertain future, he chose to identify a number of players who had 1 year left on their contracts, and move them to teams willing to sacrifice youth for a better chance at winning the Cup. "This team was built at the draft to succeed immediately, and we did. We found a great fit with Doug Weight, who went on to have an amazing year winning the Art Ross and Hart Trophies and take us into the Semi-Finals. Since then, the team has been in a decline and it has become evident that this team is not going to win a Cup in the current NEFHL landscape. The smartest thing to do for the long-term success of this franchise was build for the future. We can't be so narrow minded anymore..."
Faced with the reality that the club could only keep one of its pending unrestricted free agents, the club quickly and easily identified that that individual would be Jarome Iginla. "Iggy is a franchise player - you don't let that player go once you get him. We want Iggy to be the face of this franchise for a long time to come." So, about a week ago, the club faxed a memo to every team in the league notifying them that a number of Predators fixtures like Doan, Demitra, Boyle, Ohlund and Gerber were on the market. "Initially, we were hoping to get some NHL ready players in return, but we quickly realized that that was just not going to happen in the current marketplace. There are no teams willing to give up top young talent now to get older established talent. So we had to start thinking in the 3-5 year range." Together with assistant GM Sylvain Tremblay, who was consulted on all deals made by the team, the club found arrangements to deal the veterans. 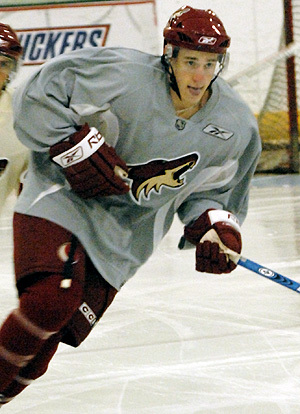 First to go, on Wednesday, July 16th, was Shane Doan to the Montreal Canadiens. In return, the Predators received Eric Fehr, Riley Holzapfel and a 2nd rounder in 2009. "Shane has been the face of this franchise for 3 years now and it was extremely tough to trade him. But he understands the situation, and the fact that Jarome Iginla is taking the reins on this franchise. Shane was excited about the idea of leading a new team, the Canadiens, out of the Eastern cellar. In return, we're really excited to get Eric and Riley. We think Eric has a lot of potential to crack the pro roster in the next year or two years at the most. We see Riley as a 2nd liner in about 3-4 years, and with Assistant GM Tremblay at the draft table, we strongly believe in our ability to turn that 2nd into a great player." On that same day, the club also dealt youngster Mikhail Grabovsky to the Toronto Maple Leafs for defenceman Jeff Schultz. "This is a deal that just made sense to us. Leafs GM Shane Jooris wanted to add Grabs to his lineup and we had identified a lack of depth at the defence position. We felt we could lose Grabovsky, especially with the addition of Fehr and Holzapfel. Jeff Schultz is a young defenceman who can step into our lineup immediately and make an impact and we look forward to seeing him play for a number of years as he grows into a great #3 or 4 defenceman." Only a day later, the club traded Pavol Demitra to the Calgary Flames for Kris Beech and Chris Campoli. Pavol came to the club at the 06-07 trade deadline and centered Jarome Iginla last season. 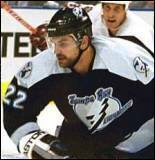 "Demitra was good for us last year, but we didn't feel he was a great fit with the team - not the way Doug Weight was. With his contract expiring, we felt now was the best time to move him. Coming our way are two more young players that we really like. Kris Beech is poised for a breakout year and will be playing on either the 2nd or 3rd line in Nashville right away. This is a contract year for him and its up to him to prove he belongs. The real key to the deal though was Chris Campoli. Together with Schultz, he provides an instant youthification of our blueline and we expect to see him them for many years as he rounds himself out into a great all-around defenceman." The final trade, completed today, saw Dan Boyle dealt to the Vancouver Canucks along with a 4th round pick for Steve Downie, Chris Summers and Richard Bachman. Boyle, like Doan, has been with the club since the dispersal draft and was dissapointed to leave. But he, like Doan, is looking forward to the chance to make a Cup run with an improved Vancouver squad. "This was the toughest move to make of them all, but it had to be done. Steve Downie was the key to the deal. We see him as the next Darcy Tucker of the NEFHL, and that excites us. We're not sure if he's going to step into the lineup this season or not, but by 2009-2010, we are going to be running Steve Downie out there against every team's top line, creating havoc." Whether or not Predators GM Mathieu Morin is done at this point remains to be seen. With Mattias Ohlund and Martin Gerber remaining as top notch UFA's-to-be, don't be surprised if they are eventually moved. The real question that remains to be answered is when?